Parents can help make the “back to school” transition much smoother for their child if they prepare in advance. Try to add activities or planned outings to your child’s day. This structure helps prepare them to be on a schedule when they return to the classroom. If the child will be going to a new school, parents may want to schedule a visit with their child before the first day. Consider taking your child on a fun shopping trip where they can help pick out their clothes, lunchbox and supplies. Ensuring your child has adequate sleep and proper nutrition is very important. Your child will do their best if they get to sleep early and eat a healthy breakfast each day before school. A daily diet of junk food is not compatible with learning. It can cause listlessness and hyperactivity which can impair a child’s ability to learn. Skipping breakfast especially is a detriment to a child’s education. Adjust your child’s sleep schedule a few weeks in advance to help avoid struggling to get them out of bed for school. Set up a consistent daily routine so that your child wakes up and goes to sleep at the same times each day. If you have not created one already, start a bedtime routine, including bathing, selecting clothes for the next day, cuddling together for a bedtime story and a kiss goodnight. Begin a regular morning routine that includes a healthy breakfast, packing a nutritious lunch, grooming and getting dressed for the day. My daughter is currently cared for by my mom (her grandmother) while we are at work. I would like to move her to a center for a few days per week when she is 15 months old, mostly for additional stimulation and socialization. Can you please recommend steps we can take to make the transition the easiest on her? Transitioning your child from home care to childcare is wrenching for every parent. In fact, most babies and young children adapt to their new environment more easily than parents do. And it’s important for parents to appreciate and care for their own emotions at this juncture. As with so many things for young children, taking it slow and easy can work wonders. If your child is moving into alternative childcare for the first time, make the transition gradual, providing lots of support. Make sure your child meets the caregivers or teachers before moving into this new environment. If you choose a childcare center or a preschool, make sure your child knows at least one other child in the class. If your child doesn’t already know someone, ask the caregiver to suggest one or two children who might be good matches for your child, and set up a few play dates. Talk to your child about the new arrangement, describing the friends to be made and the wonderful things to be done and learned. Talk about being apart and getting back together. Play games such as hide-and-seek that demonstrate being apart and together. When moving to a new childcare arrangement, start gradually, if possible. For example, allow your child to be alone at the childcare center for short periods at first, then slowly increase the time away from you. Once the new arrangements are underway, get up a bit earlier so you have time together before you leave. Also, make special family times in the evenings and on weekends. Let your child take her favorite toy or “softie” to school. Tell the caregiver or teacher of any factors that might influence your child’s behavior or needs for the day, such as a restless night, family illness or visits from relatives. Be aware that separation anxiety may come and go in cycles. You can ease your child’s upsets if you make your departure warm and smooth, staying long enough to let your child settle in, but without lingering. And never sneak out or lie, telling your little one you “will be right back” just before you dash to the parking lot. Your child needs to be able to rely on his trust in you as he navigates this new world. When you pick your child up, ask the caregiver about what happened during the day. Then discuss the day’s events with your child. Growing up is heady stuff for kids. So sleep problems are not uncommon. If your child routinely has trouble getting to sleep or wakes up at night and needs comforting, his developmental achievements give you some important new tools to work with at this age. Dr. Minde reminds parents of the importance of routine in the daily life of a child. At an age when children are learning so much so fast, predictability and regularity in the timing and location of meals, bathing, and bedtimes is soothing and comforting. In today’s environment of working parents, such routines may be harder to provide, but they are no less important to the child. He encourages parents to use quiet bedtime rituals to ease the transition. Bedtime stories are a proven staple, as are songs and prayers. But you can personalize the routine and periodically update it to match you child’s special interests, such as helping him put his favorite stuffed animal or doll to bed. When the child cries, he recommends that the parents check on the child every five to ten minutes (whatever time frame is tolerable for the parent), perhaps patting and reassuring the child, but making it clear that the child is expected to stay in bed. If necessary, he recommends that the parent withdraw from the room in stages, first sitting on the bed, then in a nearby chair. If problems persist, Dr. Minde suggests that you enlist your child’s help. You can put your child’s growing language and imaginative powers, as well as his growing independence, to work on the case. Explain that you need your sleep, and ask your child what would help him to stay clam when he wakes and to get back to sleep on his own. Perhaps holding and talking to his favorite teddy bear or snuggling with his favorite blanket. Make sure these items are within easy reach at bedtime. Self esteem begins with building trust. You can build trust with infants by meeting their needs in a timely fashion. When you respond to a child’s cry, you are showing them that they are worthy of care and love. When you meet their needs consistently the infant trusts that they are consistently worthy therefore building self-esteem. Now that your infant has trust it is important to continue building trust into the Toddler phase. Self-esteem comes from the picture the child has of himself as someone who can do things. Toddlers believe they can accomplish certain tasks and supporting their independence builds confidence that they can succeed. Offer your child activities that lead to success. Toddlers are very successful at self-care activities such as getting dressed, cleaning up after self and helping around the house but they also enjoy new activities. When planning your day, find ways for your Toddler’s involvement to be important. A preschooler’s self-esteem is all about supported choices. Unlike the Toddler phase when choices are made from selected options, a preschool child’s actions are the choice. 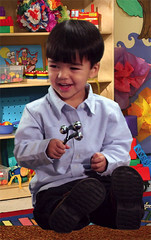 Preschool children are attracted to specific activities such as blocks or art. Goddard teachers will support that child’s choice to stay in that center every day and take the learning skills to the child. By doing so, the teacher has supported the child’s choice. The child interprets this as “If my choice was supported, I am good because my choice was good.” Consistent support will lead to the child’s trust in his own decision making, therefore building self-esteem. Pre-K and Kindergarten children build self-esteem through skill mastery. You may see your Pre-K child go back to old familiar activities or repeat activities. This process of experiencing past successes builds confidence. Ask your child open-ended questions to find out what they are thinking and know about their own activity. After your child displays their knowledge inquire with “what if?” questions to draw out the next level of curiosity. Social skill success begins to play an important role in self-esteem. Offer opportunities for new social opportunities in anticipation of the next step to Kindergarten or First grade. Establishing a strong, open line of communication between parents and teachers is an essential part of any child’s education. Doing so allows parents to always remain apprised of their child’s progress and, should a problem arise, allows for easy discussion on ways to address and remedy the situation. Never hesitate to get the lines of communication flowing. As your child’s teacher greets each new student on the first day of school, take advantage of the situation to introduce yourself as well. Ask how and when would be the best time to contact them if you have questions or just want to check in on your child’s progress. Try to communicate with your child’s teacher regularly. Frequent chats help build your parent-teacher relationship and allow for a constant flow of feedback so you both can better understand and address your child’s needs. Becoming involved in school events and/or parent-teacher organizations offers another great forum for developing parent-teacher communication. Make an effort to attend open houses, social events and/or join the school’s PTO. Once the lines of communication are established, you and your child’s teacher can work together throughout the school year to monitor and guide your child’s educational goals. We’ve always been a family of readers and take turns reading aloud together for a half hour every evening. This couldn’t be more painful for our eight year old. He’s bright but loves just about everything else better than reading. Are we pushing too hard? By third grade, children develop their own learning style, drawn from their early patterns of exploring the world. Some explore by looking, others by listening, tasting, moving, or touching. The favored mode of exploring shapes later preferred learning styles. Your child may resent reading because it draws on one of his less-preferred exploration modes. Give him a break and let him strut his stuff instead. Can he teach the family a game or share a discovery? We can’t all be bookworms – we’re simply not born that way. Don’t pretend you’re fine when you’re not. It’s much better to acknowledge your feelings. It’s normal to feel grief at this change. You will come through sooner and better if you face your feelings head on. Don’t believe you are a bad parent for choosing childcare. If you have chosen a good center or caregiver, you can be confident that your child is in good hands, so there is no logical reason to feel guilty. But if you continue to feel guilty, it’s important to come to grips with these feelings. Be especially alert if you are tempted to change your parenting style. For example, some parents start easing up on setting limits to compensate for their guilt. Such behavior leads nowhere you or your child want to go. Don’t become critical of your child’s caregiver. It’s important to have a good relationship with caregivers. Their observations and advice can be extremely helpful to your parenting. If you find you feel critical even though the caregiver’s work doesn’t merit such an attitude, recognize that your feelings are a part of the separation process. Then begin to focus on the caregiver’s talents and good qualities. Rest assured that no caregiver will take your place in your child’s life or heart. The new attachments to other warm and loving caregivers are beneficial. They also are good signs of your child’s emotional maturity and your achievement in nurturing that maturity. Don’t underestimate the importance of the transition to childcare. If you pretend the new routine doesn’t matter, you may underestimate the good things that can come from this new experience for your child and you – new friends, new learning, new sources of information and new ideas on parenting. Dinner is an opportunity to reconnect with your family at the end of each day. Make this important ritual less stressful by giving everyone the chance to create an individualized meal. It’s easier than you may think! Make enough pasta for everyone – choose a fun shape like spirals, pinwheels, or shells. Not only is the pasta pleasing to look at, it’s already bite-size! Put a fist-size amount in a bowl for each family member. Steam fresh vegetables a cup or two at a time. Choose your family’s favorites and provide variety in color, texture, and taste such as, carrots, corn, and peppers. Put each veggie in its own serving bowl. Add the “plus” to dinner with a little protein power! Place a legume or two into individual serving bowls. You could choose soybeans, peas, lima beans, lentils, or chick peas. Let the kids choose their own veggies and legumes to create personalized recipes. The sauce is up to the chef. Do your kids prefer a red sauce, white sauce, or no sauce? By providing good food choices, you are modeling a healthy attitude. By giving your children an opportunity to make their own food choices once in a while, you are empowering them to make their own decisions. Wondering how your family can make a difference and help the environment? There are simple ways to protect the planet without spending a lot of time or money. Help your children develop “green” habits now, they’ll endure over time. Reduce the number of times you run errands in your car. According to the U.S. Department of Transportation, between 1990 and 2001, the number of miles driven to shop increased by 40 percent – this increase is three times as fast as any other category of driving. Consolidate trips or, instead of traveling by car, walk or ride a bike to the store. Using a reusable bag will increase the impact of your efforts! Growing a garden is a great way to make an environmental difference. If you are limited for space try container gardening or participate in a community garden. Even toddlers can help plant, tend and harvest. Recycling compostable garbage including potato peels and eggshells in a compost bin is an additional way to enrich your garden and respect the planet. You can save water immediately by taking faster showers, limiting your bath water or installing a faucet aerator in your kitchen and bathroom. Over time, replace current water fixtures and toilets with low-flow options. Shutting off the flow while you are brushing your teeth also helps save water. When you switch from standard incandescent bulbs to compact fluorescents, you use 75% less energy. Teach your children to always turn off the light and appliances when they leave the room. Some appliances, including DVD players, use energy even when they are turned off so you need to plug them into power strips to shut-off the flow of electricity.